I've talked about this subject before. However, a recent article in the LA Stage Times got me going again. Here's the elevator speech if you don't want to click and read the whole thing: Joe Stern (whose work I respect very much) of the Matrix Theatre Company (a stalwart of the LA theatre scene for 40 years) is mounting a multi-racial production of Arthur Miller's All My Sons (in my opinion, one of the finest American dramas ever written). Those who know me well, know I have long been a proponent of color-blind casting whenever possible. There are too many fine actors of color not to allow audiences the privilege of seeing them ply their craft. However, I'm am truly struggling with the application of this concept to historical works. Or rather, works that rely on a very particular set of historical or cultural circumstances that by their very essence require a particular outlook towards casting.The desire to include racial diversity in our casting decisions should never be forced or seen as a marketing strategy. It should be organic and true. It should make sense given the time, place and circumstances of the play. Now, in the case of many Shakespearean plays, we can adapt them, bend them, twist them into a concept that supports a multicultural cast. Easy-peezy-lemon-squeezy with The Tempest, Much Ado, Twelfth Night, or Midsummer Night's Dream. But even with the Bard, there are some plays that, if done straight, just do not work unless the director conceptualizes them away from their original history and deals with that shift in a creative and justifiable way. Julius Caesar, all the Henrys, Richard III, and Coriolanus for example are real people from a particular place in history. Now Joe Stern is no dummy. He knows what he's doing and even in the article, he specifically states the challenges he faced in casting this play the way he did. The play was written in 1947 and takes place in 1946 with World War II still fresh in everyone's mind. It is set in the Midwest, where a racially mixed neighborhood was, well, let's just say, highly unlikely. Granted, the issues examined in this play are universal and large. Which then begs the question, what does the casting do to advance the meaning of the play? Now, I'm pretty confident, there will never be a mixed race cast of August Wilson's The Piano Lesson. Nor should there be. David Henry Hwang's first play, FOB, must be cast is a particular way. It is too specific. How are those plays any different that the Miller play? Does age make it susceptible? Are the concepts presented by the drama so large and universal that casting really doesn't matter? Just thinking out loud, I guess. You see, for me (I think, any way...at least right this second) we have become so concerned about non-traditional casting that we fail to advance the real issue. Playwrights must write for a multicultural society. Producers must nurture playwrights of all nationalities. Film, TV and the theatre must continue to fight racial stereotypes not just by selective casting, but by play selection. The issue is really about creating for a multicultural society in the first place, instead of trying to shoe-horn multicultural casts into existing works of the theatre. Then again, I guess what I would really like is that it wasn't an issue at all. The best actors would get the part regardless of race, color, creed, or sexual orientation. I wouldn't have to think then. 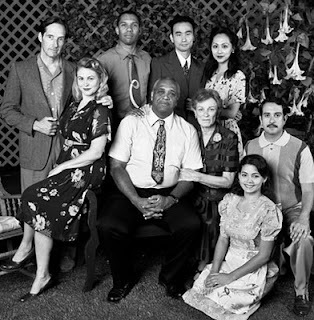 Oh yeah, go see All My Sons at the Matrix: Here's the website for tickets. Regardless of what I may think I believe at this moment in time -- this is a great play, with an excellent cast, at a theatre known for exceptional productions. I'm going. Maybe it'll help me sort things out.